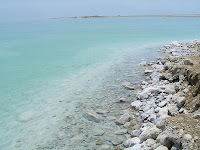 Freshwater Springs Under the Dead Sea? A Ben-Gurion University research team has discovered a series of deep freshwater springs that spring from the floor of the Dead Sea and help replenish the body’s dwindling water supply, while a German group has meanwhile pinpointed new types of microorganisms growing in fissures on the saline seafloor near the springs, the university announced. The BGU team, led by Prof. Jonathan Laronne and research student Yaniv Munwes from the Department of Geography and Environmental Development, is funded by the Sustainable Management of Water Resources in the Dead Sea Area Project of 2008-2011 from the Federal Ministry of Education and Research of Germany. Dead Sea groundwater springs have been known and visible for decades as they produce ripples on the water surface, but the current research has given scientists the ability to study springs that are hidden from the eye, according to the statement. Much like the Dead Sea itself, the springs have been around for thousands of years, and while it is “uncertain” whether they’ve existed quite as long as their host body of water, they have been there “for a very long time indeed,” Laronne told The Jerusalem Post. While his team has not yet determined how much water the springs are contributing to the Dead Sea each day, “the methodology to do so now exists,” Laronne added. In a separate, concurrent study, the second team to announce its Dead Sea findings – of newly discovered microorganisms paving the seafloor near these same springs – is led by Hebrew University graduate Dr. Danny Ionescu of the Microcensor Group at the Max Planck Institute for Marine Microbiology in Bremen, Germany, the BGU statement said. Some of the microorganisms discovered by Ionescu’s group have never before been found to survive in such highly saline environments, according to the statement. This near sensational discovery of underwater springs in the Dead Sea is quite puzzling to most people, including the researchers.